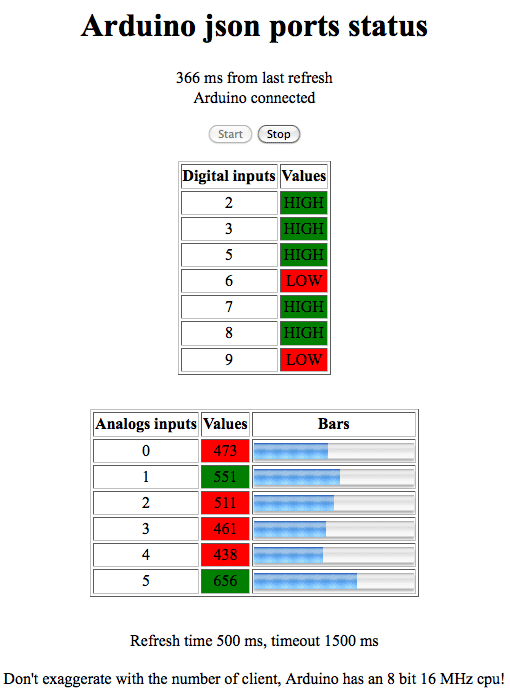 Is a web server page that show the Arduino’s analog and digital input pin status, the status of the pin is transmitted with json, the page detect connection problems with the Arduino device and alert the user. You can find it on the [webpage] coded by [bigjohnson]. Good but it can be better if done with websockets avoid need of polling. I really wanted to construct a small note to thank you for all of the great suggestions you are placing at this website. My prolonged internet look up has at the end of the day been paid with reliable facts to talk about with my good friends. I ‘d repeat that we visitors actually are very endowed to live in a superb place with very many brilliant individuals with good tricks. I feel very blessed to have discovered the webpages and look forward to tons of more amazing times reading here. Thank you again for a lot of things.